When dawn broke on a very cold Sunday the 19th January at Croft Racing Circuit it was a bright sunny morning. This was the morning of The AutoGas Jack Frost Stages Rally however no one realised that this would be the last anyone would see of the sun for the rest of the day. Sunday will live in the memory of a number of competitors for a number of different reasons. 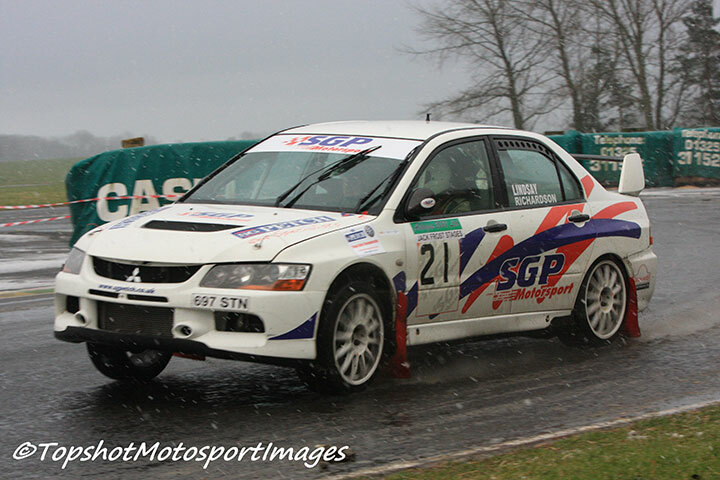 Not long after the first cars were arriving back to the service area following the opening stage it started to snow. All manner of emotions were experienced when some realised they didn’t have suitable tyres. Panic and chaos are two words which never appear very much in a rally service area. Everyone just hurriedly went about obtaining tyres from whatever source they could. Thank-fully the on-site tyre supplier had sufficient stock to meet most demands. 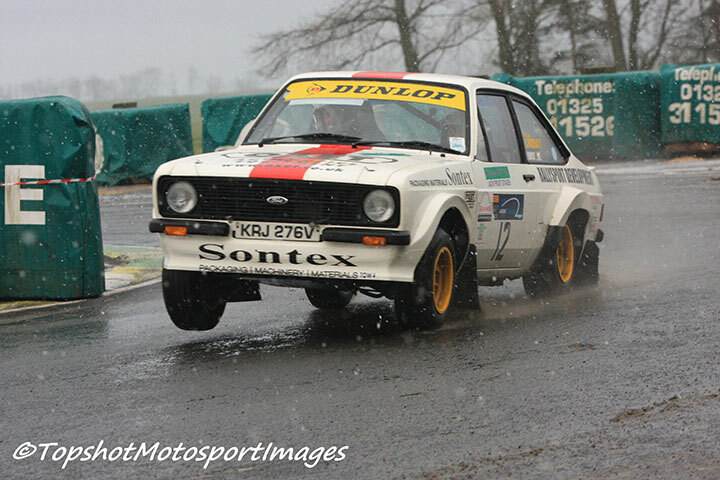 This was also the day of the ‘Prize Drives’ for the 2014 SG Petch ANECCC Stage Rally Championship. 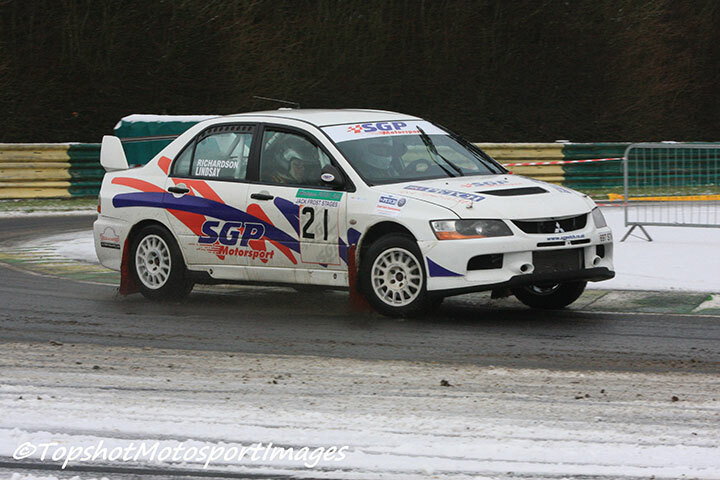 The winning driver, Barry Lindsay, who lives near Carlisle airport, was driving one of Steve Petch’s Mitsubishi EVO9’s for the day. The winning co-driver, Barry’s father and neighbour, Michael, had won the co-drivers title and his reward was the privilege of co-driving for non other than British Rally legend Steve Bannister..
Barry’s day began with a terrific first stage time and by the end of stage 3 he was leading the rally… Perhaps he’d been more awake early on but as the day progressed he dropped a few seconds each stage to the more experienced 4×4 drivers. Taking nothing away from Barry, his performance on Sunday in his first ever event driving a 4×4 rally car, will be an experience he’ll remember for the rest of his life. 5th Overall is fitting reward for such a fine performance. Well Done Barry..! Michael’s day will also be something to remember. 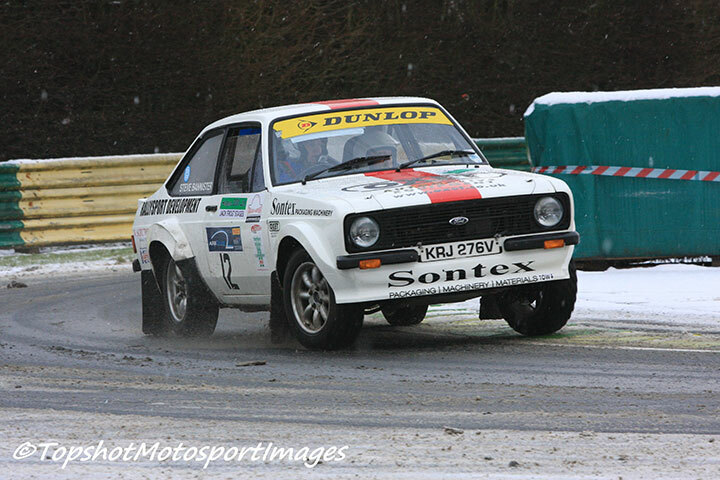 Most rally enthusiasts will have heard of Steve Bannister. Most rally enthusiasts will have dreamt of sitting alongside Steve on a rally. Michael has lived that dream, and credited himself as being a very worthy co-driver.